WINCHESTER — A Canadian nonprofit arts publisher, the Magenta Foundation has been putting together every year for five years now a volume with work by young photographers from Canada, Great Britain, and the United States. There’s also an accompanying exhibition. There are 65 images on display at this year’s show, which runs at the Griffin Museum of Photography, in Winchester, through May 9. Most are in color. Beyond that, any larger observation would be pretty nonsensical. Part of what makes the “Flash Forward’’ series interesting is that it has no visible agenda, other than focusing on good work by artists who are just getting established. No style or genre, technique or sensibility, predominates. Jeff Hutchens’s “Yichang, China’’ shows some orange peels on a car seat. That doesn’t sound very promising — or Chinese. But the moody expressivity of citrus on gray surface is both elegant and arresting. Hutchens’s handsome use of color reminds us just why oranges are called oranges. If Hutchens makes the banal seem exotic, then Matt Eich takes the exotic and makes it seem even more so. 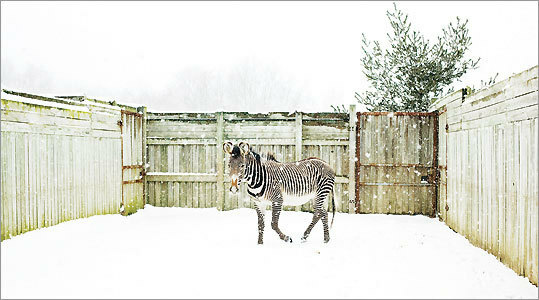 How else to describe the sight of a zebra in the snow? Marshall Byrd Sterling ups the exotic ante, with a picture of a giraffe in snow (it’s not a real giraffe, though, unlike Eich’s zebra). Conversely, Martie Giefert presents a different form of frozen water, ice. He shoots empty hockey arenas. Can you tell he’s Canadian? Giefert’s pictures are 96 inches long, and 21 inches high, which gives them about as much sense of sweep as an interior — let alone so unprepossessing an interior — could possibly have. Even emptied of people, Giefert’s hockey arenas are recognizable both for what they are and as human hangouts. The fascination of Elliott Wilcox’s two studies of empty indoor racket courts, “Squash 01’’ and “Real Tennis 05,’’ is how the angular geometry of wall, line, and floor makes them seem like abstract canvases: athletic spaces that double as painterly compositions. The results are very striking: sinister and funny and disorienting all at once. Leshko usually shoots the rides with empty sky in the background, so nothing frames them but infinity and exultation (or is it fear?). A particularly choice example is “Dangling Legs.’’ Depending on how you look it, the ride has swallowed the other parts of the riders’ bodies — or this could be a still from a production number Fritz Lang had Busby Berkeley stage for “Metropolis.’’ Either way, you can be sure it’s the most popular ride at Six Flags Over Neurosis. Both at the Griffin Museum of Photography, 67 Shore Road, Winchester, through May 9. Call 781-729-1158 or go to www.griffinmuseum.org.